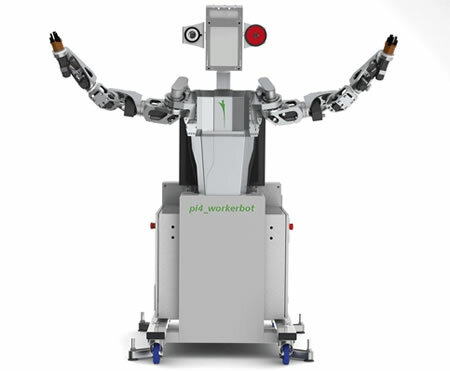 The pi4-workerbot may not be quite as fast as a human worker, but it can use its pressure-sensitive arms and 3D-camera eyes twenty-four hours per day in a factory job. 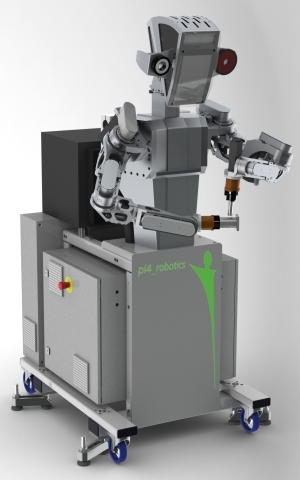 The workerbot is a robot designed by Fraunhofer Institute for Production Systems and Design Technology IPK to fill in at factories that need to increase their production capacity at short notice. Pi4-workerbot reminds me of the blue collar robot from Harry Harrison's 1956 short story The Velvet Glove. This highly adaptable robot had an additional feature not found in pi4-workerbot; it could autonomously seek work. There was the usual adjustable hook on the back wall. He slipped it through the recessed ring in the back of his neck and kicked himself up until his feet hung free of the floor. His legs relaxed with a rattle as he cut off all power below his waist.